"Wix" Reviews (Apr 2019) - Why 4.6 Stars? Wix offers one of the quickest and easiest means of getting a website online — free of charge to start. They've got a robust feature set that is growing every day as Wix leads in the browser-based web builder niche. While the support is subpar compared to that of the top hosts' web builders, the customization and ever-growing list of templates is hard to beat. “As a web builder, Wix is an industry leader when it comes to ease of use, setup time, and available features. The browser-based, WYSIWYG (What You See Is What You Get) site-building service is hands down one of the foremost brands in this industry niche, and that's not without just cause. “Wix is known as a web-leading site builder service that's one of the most affordable — because getting started is absolutely free and about as easy as processes get. You can log in via Facebook or your Gmail account and be editing your new web property within minutes. Alexandra Leslie (HostingAdvice.com): This rating is not available yet. We haven't evaluated Wix for the "Dedicated" option yet as they do not currently offer this type of hosting service. We're always working to keep our reviews up-to-date so check back later! Does Wix already offer the "Dedicated" option? Let us know. Alexandra Leslie (HostingAdvice.com): This rating is not available yet. We haven't evaluated Wix for the "VPS" option yet as they do not currently offer this type of hosting service. We're always working to keep our reviews up-to-date so check back later! Does Wix already offer the "VPS" option? Let us know. Alexandra Leslie (HostingAdvice.com): This rating is not available yet. We haven't evaluated Wix for the "WordPress" option yet as they do not currently offer this type of hosting service. We're always working to keep our reviews up-to-date so check back later! Does Wix already offer the "WordPress" option? Let us know. “Website building is where Wix shines. The thousands of templates, the intuitive editor, the industry-leading designs that cater to a variety of specific fields and use cases — all these facets represent a platform that excels at facilitating easy web design for the non-tech-savvy user. Sign up with your Facebook account or email address and get started for free. 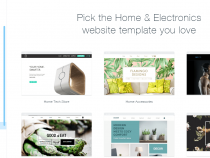 Choose from thousands of premade site templates, which are categorized by industry type and design need — e.g., Online Store, Creative Arts, or Landing Pages. The Wix Editor allows you to drag and drop elements of your site into place. WYSIWYG means that what you see in the editor window is how your site will appear once it's live. Add buttons, visual sliders, a background image, or just begin blogging. It's that easy! The Wix App Market contains hundreds of apps that infuse additional functionality and/or customization into your site. Apps are available in free and premium forms, and should be considered an ample part of Wix's offering. Call attention to your site with apps for social media marketing, search engine results boosts, and other promotional services. There's also a wealth of Wix-made apps, such as Wix Music or Wix Bookings, which are designed with this platform in mind, and helpful to a variety of industry niches. Wix's design tools are on par with the latest in web-building trends, i.e., parallax templates and mobile display editors. You can even modify the mobile version of a site independently of the desktop design. Online stores included in eCommerce and VIP plans. Plus, you'll get up to $300 in ad credits to call attention to your eShop or mobile store. The Wix SEO Wizard is an optimization and monitoring tool that simplifies the art of making your website appear in search engine results. You can get started by typing in phrases you'd like for people to search for in Google, Yahoo!, or Bing and find your website in the results. Wix reviews SEO aspects of your site based on the terms you'd like to rank for, and spits back out a report for you to use to improve. It's hard to beat hosting for four bucks a month — especially with access to an industry-leading website builder like Wix. The downside to the lowest-cost option, however, is that Wix runs ads on sites built under the Connect Domain plan. If you opt for the Combo or Unlimited plans, you'll not only remove Wix ads, but you'll get a free domain name as well. The Unlimited plan comes with, as you'd expect, unlimited bandwidth, but at that point you're paying three times the amount of some of the cheaper (and top-rated) web hosts and web builders out there. All in all, Wix wins when it comes to taking advantage of a free website builder tool for very basic websites — two or three pages max. If you're serious about your web building needs, it's worth looking into one of the more economical and efficient website builder services. Unfortunately, support tops the list of Wix reviews complaints made by users. Keep in mind, millions of folks are using these services, many of whom are using the free account or $4-plan. You can't expect the same level of customer service for a free offering as you would for a premium provider. You're also not going to get the uptime guarantees that the best web hosts will offer. So, service and reliability aren't Wix's fortes, but you certainly can get your money's worth of uber-easy design-related features. That's always a huge perk for website builders. Wondering how Wix stacks up againt other web hosting services? See our host-vs-host reviews below and compare them side by side. 4 out of 16 times. Wix is easily one of the most popular website builders on the market today, and our review reveals the platform lives up to the hype of its reputation. Getting started is as easy as inputting an email address, the cost to sign up is nothing, you can get a 1-year domain registration voucher included, and you can be designing in minutes. 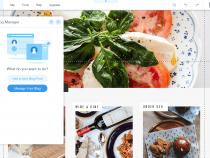 Within the Wix Editor, you can quickly and easily customize one of thousands of industry-specific themes via drag-and-drop, and you can even edit your mobile site display. 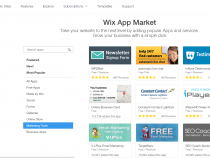 Add more functionality with any of the hundreds of apps and tools found in the Wix App Market, e.g., Site Booster or Form Builder. Finally, get your new blog or online business noticed with the help of Wix's SEO Wizard and up to $300 in search engine ad credits. Wix has certainly mastered the wonder that is carefree, code-free website building.